Moving to Finland: My SHAZAM moment? You can’t beat a good story about transformations, and whether it’s because of a magic lightning bolt, or moving to a new country, change is a powerful motivator in life. I’m a long-time comic book fan. My dad started me down that path when he bought me issues of ‘Justice League of America’ and ‘Green Lantern’ in the late seventies, and I’ve been steeped in the world of superheroes ever since. I’ve read and enjoyed books from Marvel and DC, but when it comes right down to the wire, I’m a DC guy first and foremost. I love the Marvel movies, but every time a new DC film comes out, I go into it with enthusiasm and hope. That hope has wobbled a bit with some of the DC movies we’ve had in recent years, but after the barnstorming ‘Wonder Woman’ and the bonkers fun of ‘Aquaman’, I have high hopes for ‘Shazam!’ Coming out this week. 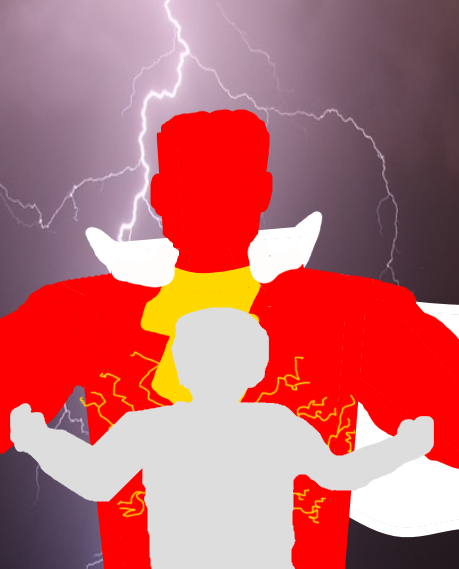 Billy Batson is a fourteen-year-old boy who can say the magic word “SHAZAM” and transform into the grown adult superhero known (originally) as Captain Marvel. Created by Fawcett comics in 1940 as a direct competitor to Superman, Captain Marvel was at one time the most popular comic book character in the world. He battled monsters, mad scientists and his evil counterpart Black Adam, but was eventually brought low by real world legal battles, as DC sued Fawcett over the character’s similarities to Superman. Captain Marvel and Fawcett comics faded away, until much later when DC acquired the rights to the character and brought him back as one of their own. That wasn’t the end of the character’s legal woes, however. During the character’s absence, a new comic book company, Marvel, had risen and created their own character called Captain Marvel. Marvel felt they should have first rights to the name, what with being Marvel and all, and the courts agreed. Since then, they have given it to several different heroes over the years, most recently to Carol Danvers, whose movie you have just watched. It led to a strange situation where DC were allowed to keep using the name Captain Marvel for its character but couldn’t call any of the books he appeared in “Captain Marvel”. Instead, we got titles like ‘The Power of Shazam’ and ‘The Trials of Shazam’. In more recent comics, DC made the decision to call simply call the character Shazam. To old school fans of the character, that name is still the name of the wizard who gave Billy Batson the ability to transform into Captain Marvel. Moving to a whole new country is a little more involved than shouting a magic word but is no less of an opportunity to change. I’ve certainly had to re-evaluate my skills and the direction of my career to reflect my new situation. But what if I could have done it with a single word? What if I had been able to shout “Suomi!” (that’s the Finnish for Finland) and transform into Kapteeni Ihme (Captain Marvel, according to Google Translate). What powers would I get from that magic word? In Finnish mythology, Sampsa fulfils the role of a god of fertility and summer: he sows the lands allowing vegetation to grow and flourish. For my new hero Kapteeni Ihme, I think the power granted by Sampsa should be linked to regrowth, rebirth, perhaps optimism. Ukko is the god of the sky, bringer of thunder, indeed the Finnish word for thunder is ukkonen. He wields a hammer which he can use to summon lightning and would probably be played by Chris Hemsworth if there was a movie about him. He is the most significant god in Finnish mythology, and just like Zeus in “Shazam” I think this is where we derive a good part of Kapteeni Ihme’s power. Finland has a goddess of beer, how awesome is that? I couldn’t find much more than that about her but including her in Kapteeni Ihme’s power set is irresistible. Perhaps the courage of one beer? But remember kids, don’t drink and fight crime! Ah, but better, she created the first ale with the help of foxes, squirrels and martens. She sent each out in turn to seek ingredients when the previous search failed. That’s tenacity, that is. Goddess of forests and the hunt, Mielikki is also linked with healing and luck. But the thing which appeals to me most is that she is said to have created bears. Mielikki is Mother of Bears. So, I think she should grant the Kapteeni something like strength, endurance or ferocity. Artificer, inventor and smith, Ilmarinen is one of the key figures in Finnish mythology and the Kalevala, so much so that even I’d heard of him (sidebar, I named a spaceship after him in one of my short stories). 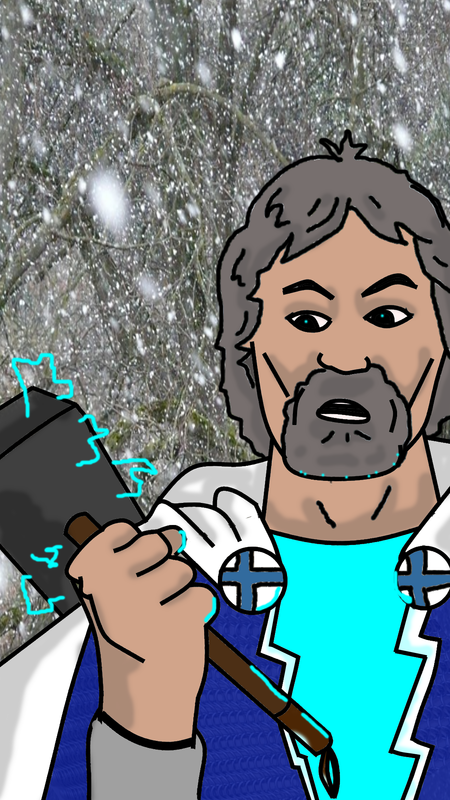 Like Ukko, he too is usually shown with a hammer, so I think we have a candidate for Kapteeni Ihme’s weapon of choice. More importantly I think his creativity would be a great help in the good Kapteeni’s adventures. You know what… I think Kapteeni Ihme would do well as an entrepreneur in a Finnish startup.